A few months back, I wrote of my grandfather, who served in World War II aboard L.S.T. 560, one of the "Landing Ship, Tank" vessels that brought soldiers and equipment ashore in the Pacific. Interestingly, that posting -- in which I noted a few of the places where I've worked the number 560 into my work -- brought me into contact with the sole surviving shipmate from his engineering team. Lt. Walt Wittholz happens to be the national president of the United States L.S.T. Association -- and in the intervening months, I've had the pleasure of corresponding with him about my grandfather and that time in the war. Providing him some of my grandfather's photos, he identified every member of the crew and detailed what was going on in some of the images. E.V. 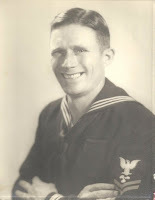 Taylor, my grandfather -- he always preferred using just the initials, and even his wife called him "Taylor" -- enlisted in the Navy at the start of World War II at Grand Prairie, Texas, Naval Air Station. He was already in his 30s when he enlisted; my mother was still a child at the time. He served as Chief Motor Machinist Mate in the engineering division aboard L.S.T. 560 in the South Pacific during many of the major invasions, including New Guinea, New Briton, Borneo and other Philippine landings. The main action photograph I posted here some months back depicts L.S.T. 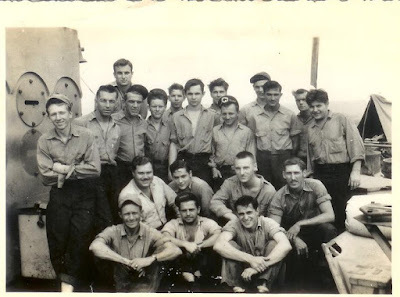 560 during the invasion of Brunei Bay, Borneo, Lt. Wittholz writes. Next to it, L.S.T. 640 displays the pontoon bridges chained to the side, which were used for decking, if necessary. "These are Australian troops we picked up on New Guinea," he writes. "These soldiers never took their clothes off and would not go below decks even to eat. Every day at 2 p.m., the war stopped and they would sit down and have their tea. After 2 p.m., they would pick up their guns and start shooting again." As noted, Walt Wittholz is the only surviving member of the team; my grandfather died in 2000 at 91. Out of the 128 members of the original crew, Lt. Wittholz only knows of six to eight remaining. My grandmother, Nell Taylor, was working during the war, too, as a "Riveting Rosie," a civilian employee for the Army. She went to welding school and then became chief inspector for the Army at North American Aviation in Dallas, Texas. 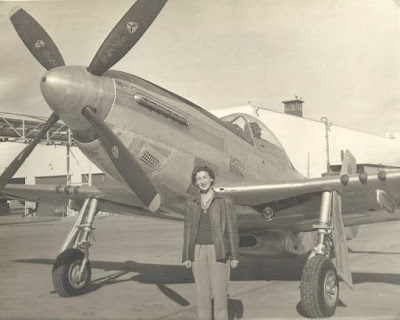 She had top security clearance on the P-51 Mustangs (120 days to produce an airplane that would fly faster than the German Messerschmidt). She said the P-51 Mustang at that time was the world's fastest plane, with a cruising speed of 425 m.p.h. and a diving speed over 500 m.p.h. Shown here in 1945, Nell was in charge of final inspections on the planes. She used a "magma-flux" which was used to X-ray the planes' structures for weaknesses or cracks in the metal. Sadly, it was her exposure to these high levels of radiation that likely caused her to have skin cancers in later life. She died in 1996. It's an honor this Veteran's Day to remember my grandparents and those who served and worked with them -- and it's been a pleasure hearing from Walt. I'm sorry my grandfather didn't live to find out about the National Association, but you can, by visiting the website of the United States L.S.T. Association. Based in Toledo, Ohio, it recently celebrated its 25th anniversary. And you can visit the one of only two intact L.S.T.s in the United States, L.S.T. 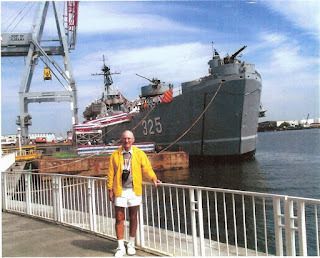 325, at the USS LST Ship Memorial in Evansville, Indiana. Walt appears with the ship here, as it was brought back from Greece in the winter of 2000-2001. I'm planning on making the trip myself, when I can. Additional thanks to my sister, Kathy Summers, for her help in compiling this information. Lost Tribe #5: Purgatory now online for Kindle! Star Wars Knight Errant #3 preview online! Knight Errant #2: Lord Daiman has arrived!